This is an update to The Parking Prankster's earlier post which mentioned POPLA delays. Back in April, The Prankster's last appeal was adjudicated 20 days late. The Prankster's current appeal is already 22 days late, and today he received the following from POPLA. I can confirm that, unfortunately, due to the large number of appeals now being received at POPLA, there is now a delay in appeals being considered. Your appeal should be considered within the next three or four weeks and as soon as a decision is made, it is forward to both parties. That means that POPLA are now running 43-50 days behind schedule. So while we do not know the exact values in days for the performance indicators, we can be sure that POPLA want to keep to them. How can they cut down the time needed? One way of doing this is for them to act smarter, and we have already seen this in action. There is no need for them to wade through a forty page evidence pack from the Operator if the motorist asked to see a contract and the Operator did not provide one. Bang! Appeal upheld! Next! Another way of cutting down the time is to add staff. More bodies = more cases that can be processed each day. The Prankster's previous post on POPLA costs shows this is already happening. However, this does not seem to be cutting into the backlog. Solution? Even more bodies! This solves POPLA's problem, but it then becomes the BPA Ltd's problem. From The Prankster's previous post we saw that as POPLA's wage bill increases, they don't really care because they pass all costs directly onto the BPA Ltd with their monthly invoice. The BPA Ltd then funds this from the levy they make on all the Parking Companies. The problem is, this levy is intended to fund a whole host of things, not just POPLA. The more money POPLA costs, the less money BPA Ltd has for everything else. As they are a limited company, this directly affects their profits. In theory, if the POPLA costs increase sufficiently, the BPA Ltd could even go bankrupt! In practice, this is not likely to happen; they could adjust the key performance indicators, for instance, so POPLA have longer to process cases. So, how can the BPA Ltd protect their profits, which of course you can be sure their shareholders are very keen to happen. We know this is not happening because over 60% of motorists are winning their appeals at POPLA (as of Feb 6th). 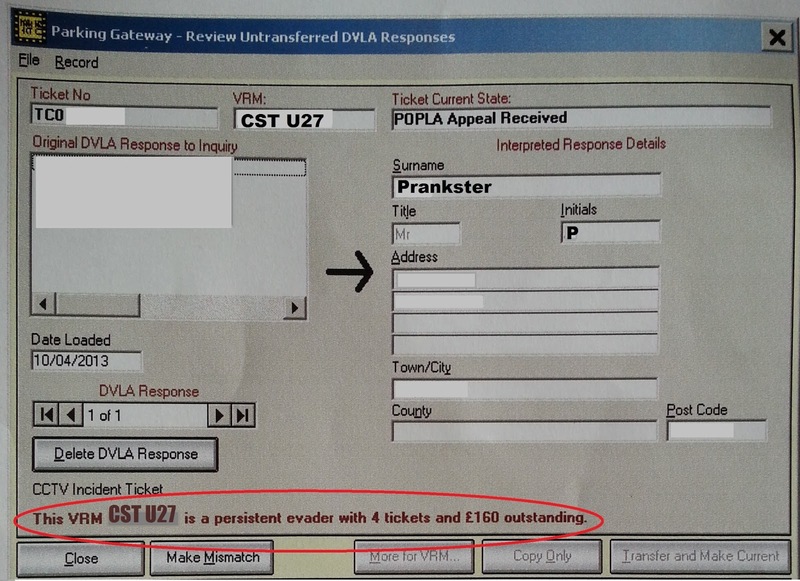 As an example, The Prankster currently has a ticket from Smart Parking Ltd. He appealed to Smart Parking, stating that the signs were in the name Town and City Parking Ltd. Smart Parking waffled a little, not answering the question, and provided a POPLA code, which The Prankster duly used. Smart Parking, in The Prankster's humble opinion, do not have much of a chance at POPLA, seeing as The Prankster has asked them to supply a contract in the name of Smart Parking and they have not done so. Other POPLA cases have had their appeal upheld for the same reason. We still have to wait another few weeks of course. Who knows, the Prankster may still end up with egg on his face if Smart Parking rustle up the missing document. But, if they don't, then Smart Parking should never really have let this get to POPLA. This will, after all, cost the BPA Ltd £137.30. That's not really fair on the BPA Ltd. Perhaps the BPA Ltd will start to get tough on Parking Companies making vexatious claims for money and flouting their code of practice with regard to appeals. They have the right to audit the Parking Companies and check that their appeal processes are fair. Perhaps they could do no better to start with, than to get the list of Parking Companies from POPLA with the highest percentages of appeals upheld. If they find that those companies are not playing fair with the motorist then they can write to them requiring them to make changes by a specified date, and after that, issue sanction points. If a member accrues 12 sanction points they can be suspended or even expelled, effectively shutting them down. In the past, the BPA Ltd did not have any great incentive to issue sanction points. Perhaps now that the operator's actions will be having a direct effect on the BPA Ltd's bottom line, they will be a bit freer with awarding them. To answer that question, we should look first at how POPLA, the independent adjudication service for parking on private land, is funded. POPLA receives it's money in two ways. Firstly, it got a chunk of money to set up in the first place. It then gets a monthly payment based on actual expenses - wages, building rent, phone bills, postage, etc. This money all comes from the British Parking Association (BPA) Ltd which is billed monthly by POPLA. The BPA Ltd then recoups that money from its members in the following ways. Firstly, the BPA Ltd charge the appropriate member £27 for each POPLA appeal. If that is not enough (and it probably isn't, as we will see later), then each member pays the BPA Ltd an association fee based on the size of the company, and any shortfall is made up from that. That's all very well in practice, but how does that look in hard cash terms? The January figure is a little inflated because POPLA forgot to bill 8-10k for the 3 previous months. Overall this comes to a total of £246446, or £310946 if you include the setup fee. This works out at an average of 41k a month (not including setup). However, we can expect to see that rise. Staffing costs were low in Oct and Nov as the service took off. The February and March figures include extra staffing costs to try and clear the current backlog. This might fall over time, perhaps if less people appeal, or if the assessors get quicker at adjudicating cases, meaning fewer staff are needed. However, it might also rise over time. Given that currently 61% of cases are judged on the side of the motorist, there is nothing to lose and everything to gain for a motorist to appeal. As knowledge of POPLA increases, we may therefore see the number of appeals rise. The BPA Ltd estimated initially that there would be 23k appeals per year, but have now revised this to 17k. Time will tell of course, but an estimate of 50k/month does not seem unreasonable for the running costs of POPLA. What do the Parking Operators get out of this? Currently we only have 2 sets of figures for POPLA, from 25th January and 6th February. Further, these figures may not actually be for those days, but for a few days previous. We can see a few things from this. Over the time period, 61 new cases arrived, and 193 were resolved. Perhaps this means that POPLA are getting to grips with the backlog issue. We probably need more data to get a better picture. However, in April the backlog on The Parking Prankster's case was 20 days, and in May the backlog is already over that, so perhaps the backlog problems are not yet solved. Let's look at the Feb 6 figures. The Operators had won 328 cases, and the BPA Ltd are reporting that in 70% of cases where the motorist loses at POPLA, they pay up straight away. Thats 230 cases. Assuming an average charge of £130, this gives the operators £29918. They had to pay out 843 * £27 for this privilege, or £22761. They will no doubt be very happy with their £7k profit. Assuming it takes 2 hours for them to prepare a case for POPLA, this works out at a very exciting return of £4.25 an hour, or a little below the minimum wage. This may increase a little if the Operators take the other cases to court, and win. On the other hand, the Parking industry is clogging up the courts at the moment, so that money won't be coming in for a long time, if at all. Minimum wage? That's not too bad, is it? By the end of January, the BPA Ltd had paid £145668 in monthly fees to POPLA. In reality, any shortfall from the £27 per case fees has to be paid for by the Operators via their subscriptions. So the true balance sheet reads something like this. So there you have it. Each case submitted to POPLA costs the parking operators an average of £137.30. Now, seeing as the average parking charge the Operators want is around £120, that does seem like an excellent incentive for the motorist to take their case for POPLA! Note of course, that if the Operators acted sensibly, and only referred cases to POPLA where they had a chance of winning the figures would be completely different. Remember, they currently lose 61% of cases. Perhaps the real incentive then, is for the Operators to cancel the 61% of parking charges where they will lose at POPLA. The more people that appeal and use POPLA, the quicker the message will get through. All figures used here are taken from FOI requests. The Parking Prankster is grateful to his sources. You know who you are! The Parking Prankster recently learned that he has been labelled a 'persistent evader' by Smart Parking. through the courts if necessary. As Smart Parking have not produced either their authorisation or the relevant sections of the Operator's Handbook to POPLA, The Prankster feels quietly confident the adjudicator will be consistent with previous judgements such as here, post #7. The Appellant made representations, submitting that the case of VCS v HMRC held that the Operator needs rights of occupation or possession in order to have authority to issue parking charge notices. The Appellant submits that the Operator does not have this authority. Membership of the Approved Operator Scheme does require the Operator to have clear authorisation from the landowner (if the Operator is not the landowner),to manage and enforce parking. This is set out in the BPA Code of Practice.Therefore the Operator is likely to have authority to issue parking charge notices. The Operator also submits that they have a contract with the landowner that authorises them to issue parking charge notices. However, as the point was raised by the Appellant, then the Operator should address it by producing such evidence as they believe shows that they do have authority. A copy of the contract the Operator submits they have with the landowner has not been produced. Having carefully considered all the evidence before me, I must find as a fact that,on this particular occasion, the Operator has not shown that they have authority to issue parking charge notices. As the Appellant submits that the Operator does not have authority, the burden of proof shifted to the Operator to prove that they do. The Operator has not discharged the burden. The Prankster suggests that anyone with a ticket from Smart Parking might also ask when appealing to POPLA to see the relevant documentation from the Operator, satisfying 7.1 and 7.2 of the BPA Ltd code of practice. Anyway, back to the actual subject of this blog. Exciting news! The Prankster has just received notice that Smart Parking themselves have cancelled one of these tickets, taking the number of outstanding tickets down to 3. The Prankster therefore has high hopes that he might now be downgraded from 'persistent evader' to 'occasional evader' or even 'might be an evader, but most likely we accidentally ticketed him without any legal basis for doing so'. Here is The Prankster's successful appeal. I have received the invoice referred to above and as my car was not parked at this location between the times stated I wish to invoke your appeal process. Your parking charge notice shows pictures of my car at 06:22 and 18:54. I enclose a copy of a parking charge notice from one of your friends showing pictures of my car at 09:38 and 16:14. Obviously my car cannot be at both places at the same time. I require you to respond within 14 days, then either cancel the invoice or issue me with a POPLA code within 35 days. Any communication with me other than acknowledging this letter, cancelling the invoice or issuing a POPLA code will be treated as harassment. Phew! What a relief it will be when I finally get downgraded to 'parker'. Of course, The Prankster still has the parking charge from the other company to worry about. They haven't cancelled yet, but The Prankster is sure they will see sense rather than cost themselves £27 at POPLA. A recent FOI request gives an idea of the scale of the parking industry. The parking companies need to write to you to get you to pay up, and so they ask the DVLA for your address. Between 01/04/12 and 31/03/13 parking companies made 1,897,572 electronic requests for your data. There were also 319,739 paper requests, but not all of these were made by parking companies. You will have to allow allow me some guesswork from now on. If anyone has references for better statistics or figures, please get in touch. Also, if you hate maths, just skip down to the next heading! Let's assume that half of the paper requests were from parking companies. That makes 159869, giving a grand total of 2057441 requests. Each request is for one parking charge - you are not allowed to lump them together. Now, not everybody knows that private parking tickets are largely unenforceable. Let's estimate that about 40% of people pay up; thats a total of 822976. How much money does that equate to? The BPA suggest a maximum parking charge should be £100. Surprise surprise, most parking companies therefore make their parking charge £100. They have to give a 40% discount for early payment, making £60. However, they can also add on money for late payment. Highview parking, for instance, add on another £40 if you pay after 28 days. I have no idea how many people pay at each stage, so lets assume it's equally spread out, and that the average payment is £100. If anyone has better figures, please get in touch. An average payment of £100 x 822976 gives us £82,297,600. But wait! There's more. Some people pay up even before the parking company asks the DVLA for their details; they see the yellow sticker on their window, panic and cough up. Let's guess that an extra 10% of people do this, or 82,297. They paid early, so the cost to them is £60, or a total of £3,291,880. Yes, that's right. Parking companies leach an estimated amount of £85,589,480 out of the economy each year. This is dead money. It doesn't provide anything useful; we all got along perfectly well before these companies existed, using systems such as barrier controls and the like. Moreover, this money comes predominantly out of the pockets of the poorer members of society; pensioners, disabled people and low paid workers. This is because these are the most likely people to cave in to the demands of the parking companies. This money is sucked from their pockets into the directors and shareholders of the parking companies, financing their yachts, cars, foreign villas and so on. When the economy is struggling, such as now, this money would be far better off back in the pockets of the people it actually belongs to. Everybody is struggling right now to make ends meet, and a huge parking bill can mean serious difficulty for some people. Not having money causes lack of consumer confidence, causing lack of spending on other things, which depresses the economy leading to depression. More than eighty five million pounds a year is being sucked out of the economy right now by the parking companies, money the country could really use to help get us back on our feet. It gets worse. The parking companies would really rather we all paid up. if that happened, that would take the bill to £193,049,080 - nearly two hundred million pounds a year! And the parking companies are expanding their operations, placing ANPR cameras in more and more car parks. Would you be happy to see two hundred million pounds a year leached from the economy? Or even eighty-five million? Well, luckily most parking charges are not enforceable. If you have a ticket and want to fight it, hop over to parking cowboys, pepipoo or moneysavingexpert for free advice. Another gem from the January 2013 minutes of the AOS. The vehicle was not improperly parked: e.g. that the vehicle was not parked where stated on the parking charge notice; that you believe you were still within the time you paid for; that the voucher was clearly displayed or that the conditions were not properly signed. The parking charge (ticket) exceeded the appropriate amount: e.g. that you are being asked to pay the wrong amount for the parking charge or that the charge has already been paid. The vehicle was stolen: e.g. that the vehicle was improperly parked after being stolen. However, the fact that someone else was driving your vehicle, for example a family member, friend or colleague, is not in itself a valid ground of appeal. The fact that you told the driver that they could only use your vehicle on condition they did not get any parking tickets is not a valid ground of appeal. I am not liable for the parking charge: e.g. that you had sold the vehicle before, or bought it after, the alleged improper parking. However, the fact that you had paid to park the vehicle in the first place (even if, for example, the voucher was not clearly displayed) is not in itself a valid ground of appeal. Apparently however, this list is not exhaustive. Here is the quote from the January minutes where the POPLA representative says the motorist can use any grounds they like. So there you have it. You can use absolutely any reason...just as long as your mind is focussed. And you are clairvoyant. Oh, and you better have some way of magically rewriting web forms as well, because you can only use those four reasons when you appeal online. The Prankster urges POPLA to clarify this on their web site. It simply cannot be fair that POPLA say one thing in a mostly-secret meeting, yet do not say the same to motorists on their web site, and in fact make it impossible to appeal under any other grounds. If you feel the same, then you can make your point to London Councils, who run POPLA, here. So, the meeting was Jan 25th, which means POPLA had been up and running for around 8 weeks, or 6 if you count the Christmas break. Not taking IT and other teething problems into account, this gives them a throughput of 650 appeals in six weeks (assuming he meant to say 'processed 650 appeals' rather than 'received 650 appeals' which does not make sense). This is about 110 appeals a week, or 22 a day; lets call it 20. That means their backlog is currently 42 days, or well over a month. The Prankster looks forward to the April report for an update on this situation.. I am not liable for the parking charge: the most common successful reasons are: the operator did not have a contract to issue tickets and follow up in court; the operator could not justify the charge as a genuine pre-estimate of loss; the Notice to Keeper was not compliant; perhaps even, this was a first-in last-out ANPR error! Perhaps that's taking hope a bit too far. But hey, if you think the web site should say that, you know where the complaints page for London Councils is! If 60% of appeals that the operator rejects are being upheld by POPLA this doesn't seem too much like the operator's complaints procedures are run 'fairly'. I doubt whether the BPA Ltd will worry too much about that though! Yesterday, as he has many times before, The Parking Prankster had a long chat with Geoffrey, the Parking Warden in his local car park. Geoffrey is a sweet old guy; I guess he is retired and earning some extra pin money managing car parks, but I never asked. He loves to chat on any subject, although parking is an obvious one for us both to settle on. He looks after several car parks, taking an hour to go round each one, carefully marking down number plates in pencil in his neatly-lined notebook. My guess is that he knows the number plate of each of his regulars. "That red one," he points out to me as we speak, "she was a right terror! Kept filling in the wrong number when she paid by Ringo (telephone). I had to leave four notes under her wiper before she learned how to use it properly." Notes, not tickets. You see Geoffrey isn't one of those parking wardens trying to exploit his customers. He cares about them and wants them back. He's not interested in ticketing for minor transgressions. If someone parks in his disabled bays who isn't disabled, he would rather have a quiet word and move them on, than hide in his office and leap out to ticket them as soon as they leave the car park. If a car doesn't have a ticket, he always leaves plenty of time in case the motorist is off to the train station. Although you are meant to buy your ticket straight away, even if you use Ringo, Geoffrey realises that if people are hurrying to catch a train they may need some time before they settle down to buy their ticket. If only every warden was like Geoffrey. Then the motorist wouldn't have a problem with the parking industry. I fear for Geoffrey - not his real name for obvious reasons. One day I expect to see a new guy there, officiously ticketing everything in sight, and explaining Geoffrey had to be got rid of for "not meeting targets." "He was a harmless old buffer, but didn't really understand the parking industry. Never mind, I'm in charge now. If I can get out 10 tickets a day I'll soon make reserve-lieutenant-colonel parking warden status." Even worse, perhaps he will be replaced by ANPR. That seems to be the way the industry is going. One would expect as a motorist that once your case has been upheld by the independent adjudication service POPLA, that that would be the end of the matter. Not so. The Parking Companies have a hotline to the adjudicator which they can use to reopen the case if they so desire. The January 2013 minutes of the AOS Board, made available through an FOI request, show this. In cases where the Parking Company is not happy with the result, "the matter should be referred back to the Adjudicator, who can re-open the case if necessary." The minutes do not detail all the situations where the Parking Company can re-open cases, but it does include the situation where the Parking Company cannot get its act together and send off the evidence in time, resulting in the Adjudicator inconveniently and efficiently upholding the appeal. "If you made a formal complaint about specific alleged misconduct by an Assessor, it would be investigated by the Lead Adjudicator. However, this is not the same as merely disagreeing with the Assessor’s decision." ...implying by omission that cases cannot be reopened. In any case, there are no contact details or other instructions on the web site, which makes it rather hard to actually submit a complaint. The Parking Prankster tried his hardest to guess how to make a complaint, and sent one off last week. So far there has been no reply. Perhaps the person who deals with complaints is one of those who only "currently work 1 day per week", as mentioned in the minutes. If you didn't guess how to do all this, then tough cheese. To be fair to the AOS, some members were a bit concerned that using this backdoor method to reopen cases would be seen by the public as "damaging POPLA's credibility" and bad for "the reputation of POPLA". However, other member's apparently thought otherwise, as no actual decision not to routinely backdoor POPLA was made. In any case, the POPLA representative made clear these issues could be tidied up secretly during POPLA's "weekly conference call." What a pity the motorist does not have the same opportunity. Is it any wonder that the meeting feared for "POPLA's credibility". What happens if even the adjudicator turns down the Parking Company? According to the BPA Ltd code of practice, that should be it. 22.17 If POPLA decides that you have failed to demonstrate that a parking charge should be upheld, in whole or in part, you must follow its decision. But not so the members of the AOS, who think the very act of appealing to POPLA means you are "admitting [you] were the driver", and not some other party such as the Registered Keeper. If the Parking Company doesn't like the decision of POPLA, the person making the appeal can then be "pursued under contract law." Well, all pretty interesting stuff, and there are plenty more gems in the minutes for October and January. The Prankster thinks he might make one or two more blog posts in the coming days, and looks forward to reading the April 2013 minutes too when they become available. 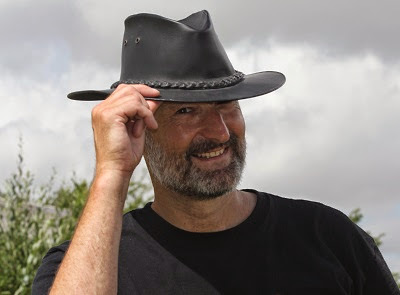 The Prankster would like to thank Angus Gill for making the FOI request, and TRX75 in this thread on pepipoo for making him aware of the minutes. Woke up this morning to find the blog stats had gone crazy. I also love the way the comments quickly degenerated into random other topics, such as delivery charges. Well, that was a story about a story. Back to 'real news' with my next post. The Parking Prankster often double dips car parks - visits them twice in one day. Just in case the parking company tries it on and pretends The Prankster has been there all day, The Prankster always makes sure to get plenty of photographs of the vehicle in other locations. Here is The Prankster's latest case. The Prankster knows that Parking Companies always reject appeals and so never bothers to try too hard to win these. It's best to keep the power dry for the proper appeal at POPLA. As my car was not parked at this location between the times stated, I can only assume that you have made a mistake. Fortunately for the last few years I have begun to suspect that I am cultivating superpowers. I believe this is because I may have been bitten by a radioactive spider when I was a child. The particular superpower I possess is to cancel any parking charge notice issued to me. In the unlikely event you possess enough kryptonite to overcome my superpowers, and you refuse to cancel this invoice,please issue me with a POPLA appeal code. 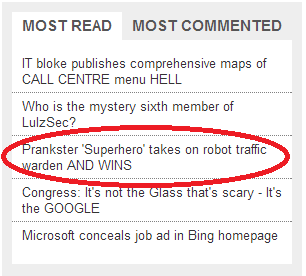 Please note that the Prankster is a responsible superhero. The Prankster only uses his powers for good; not evil. The Prankster never uses his powers to cancel a legitimate parking ticket, where the PPC has a proper contract with the landowner, has the correct signage in place, obeys the BPA Ltd code of practice, issues the ticket in accordance with POFA 2012 and charges a genuine pre-estimate of loss. Er, that means he always uses his superpowers then. Oh well. We are unable to accept your claim that you have superpowers and your claim bears no relevance to this matter whatsoever. It's so difficult possessing superpowers. No-one ever believes you. We received an appeal, in the loosest possible sense of the word, from The Parking Prankster on the basis that he was bitten by a radioactive spider and, as such, has superpowers which include cancelling any Parking Charge Notice issued to him. His appeal was rejected on the grounds that we are unable to accept his claim, which bears no relevance to a serious appeals process. The Parking Prankster's correspondence made it clear that, in the event that his appeal was not accepted by us, he would appeal to POPLA. You are therefore essentially being asked to assess and comment on the case of a deliberately evasive and deceitful driver who wishes to make a mockery of the issue of Parking Charge Notices and the appeals process thereafter. Needless to say, as a company that strives to adhere to the best practice in the industry, we are monitoring the outcome of this case very closely and would be both astonished and spurred into immediate further action if any credence were given to The Parking Prankster's claim. As a postscript to this summary, we know you will appreciate that we can only summarise what we have received and cannot summarise that which has not been sent to us. We can confirm that we have only been sent one letter by The Parking Prankster and his appeal was rejected on the above grounds. Anything that was subsequently sent to POPLA without being sent to us can obviously not have been considered by us. Having recently had sight of The Parking Prankster's most recent claim, we would point out our strong belief that our timings are correct and that the PCN was issued correctly. It is extremely interesting indeed that we pointed this out to The Parking Prankster in our response of 21st February 2013 and he did not respond to us at all but rather contacted POPLA, making a claim that he did not make to us at any stage. Well, a bit of a weak case in The Prankster's opinion. A lot of diatribe, much ranting and raving but no actual substance. Let's see what POPLA has to say. Well, The Prankster is happy with the overall verdict, but will still need to take POPLA to task for a few things. What's all this about 'The photographs are not time or date stamped' for a start? They are all time stamped in three different ways. And POPLA can't read industry standard CCTV data? The Prankster will have to ask POPLA to give their assessors some more technical training, no doubt. Anyway, now that Highview Parking have lost, no doubt they will be carrying out their promise to be "spurred into immediate further action". part, you must follow its decision. against you and grants the appeal. No doubt the immediate further action will be to follow POPLA's decision then and not continue with the claim. Parking operators don't like you using POPLA, the independent appeals body. It's hardly surprising when you consider that operators routinely turn down practically all appeals, while currently POPLA uphold over 60% of them. They therefore try all kinds of dirty tricks to stop you using POPLA. In this post we look at the latest sneaky trick used by Smart Parking to try and convince the motorist it's not worth using the independent POPLA appeals service. If you wish to appeal to POPLA the details are below but please be aware that POPLA cannot accept appeals in mitigation or appeals that differ from what the operator (Smart Parking Ltd) have originally received. Now, the 'appeals in mitigation' bit is probably correct. The Prankster has never seen a POPLA appeal upheld over mitigating circumstances. However, the bit in bold is a definite porkie pie; POPLA will accept appeals on any grounds. This is only fair after all. Once you start to research the subject all manner of reasons why the parking charge may not be valid start cropping up, reasons the parking industry would prefer remain hidden. Just because it took a bit of time and digging to uncover these reasons is not a valid reason for them to be barred from an appeal. 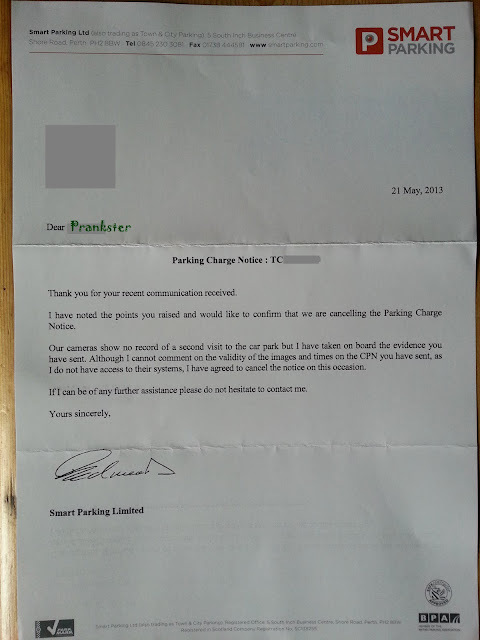 If you got one of these letters from Smart Parking turning down your initial appeal and therefore decided not to appeal to POPLA, all is not lost - however long ago this was, right back to 1 October 2012 when POPLA started. It doesn't even matter if you have paid Smart Parking. You can re-activate your case and if you win Smart Parking are required to give you a full refund! Normally, POPLA only accept appeals within 28 days of the operator refusing your appeal. However, if there are special circumstances they will accept late appeals. It's definitely a special circumstance if the operator deliberately misleads you with regard to the reasons you are allowed to appeal! Include text something like this at the beginning of your appeal to let POPLA know why they should consider you past the 28 days. "POPLA cannot accept [...] appeals that differ from what the operator (Smart Parking Ltd) have originally received." This caused me to believe I could not appeal. I have now found this is incorrect, and wish therefore to use the POPLA appeal service. If POPLA refuse to reopen your case you can complain to their overseers, London Councils. What you can also do? If you feel strongly that Smart Parking are playing dirty tricks you can complain to the British Parking Association Limited about their conduct. The BPA Ltd welcome complaints showing the dirty tricks their members use. After all, it is only by concerned motorists bringing these sneaky methods to their attention, that the BPA Ltd will ever find out how naughty their members actually are. The BPA Ltd use these complaints to impose sanctions against offenders, including banning them from DVLA access which effectively cuts their revenue stream to almost zero. The operator has deliberately misled me on the reasons as to why I could appeal to POPLA by using the following text in their letter to me. This caused me to believe I could not appeal. I have since found this is incorrect and wish therefore to bring this sharp practice to your attention. If you believe that your data, provided to us by the DVLA, has been used inappropriately you may address your concerns formally to the Information Commissioners Office or DVLA directly. These people welcome complaints; after all, it is only by receiving large numbers of complaints that they become aware of the scale of the problem.